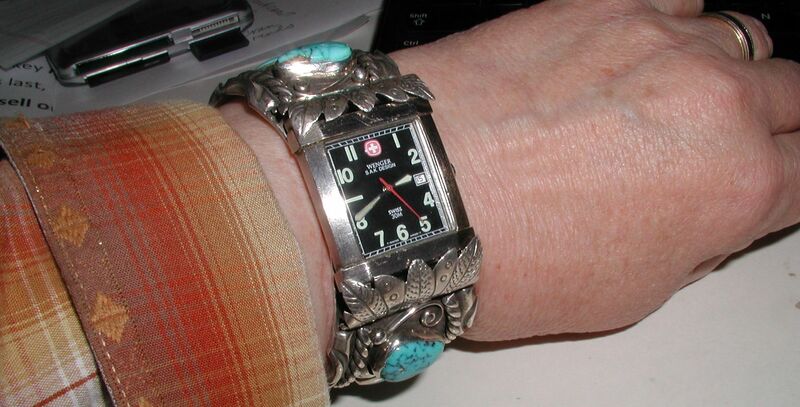 How do I change the battery in my Native American watch cuff? Some time ago my husband purchased a beautiful Tommy Moore silver cuff watch from you. Now the battery needs replacing and we are wondering how this is done as the watch is enclosed in silver “fingers” (for lack of the proper term!). The jeweler says the silver “fingers” will have to be straightened or bent upward so the watch can be removed and it’s possible these will break thereby ruining the whole cuff. The spring bars are located in blind holes and are not detectable from the outside case. Is there a better way? Any suggestions? That is the way Navajo cuff watches are designed. Yes, that is the way it is done. The exterior (decorative) wings (see photo above) are opened up. The watch face is held in place by a set of interior anchor tabs (see photo below). The watch is slipped off the tabs, the battery replaced, the watch face returned to its spot. Tabs folded down, exterior wings folded down and and locked securely into place. Most jewelers that have done it once or twice know how to do it. The watch you are referring to that was sold was indeed unique because of the fact the watch face was mounted on the end of the cuff rather than in the middle. It was the first and only watch like that we have ever had in our pawn shop. Link watches where all but the watch face is Native American made. Cuff watches where all but the watch face is Native American made. Since the above cuff watch is a very large men’s watch, here is another example of a more typical ladies cuff watch from the front and the back so you can see how it is very much like a cuff bracelet. As far as emailing you when we get more cuff watches in, I’ve tucked your email into my WANTED folder and will do my very best to alert you……..BUT really the best way to see our new items is to watch our NEW ITEMS page. Every day we list a number of new items and they show up there first. Have fun browsing and let me know if I can answer any other questions.